Relive the Le Mans of years gone by with the sixth Le Mans Classic. Held every two years and covers race cars from 1923 right through to 1979. These are split into six grids and between them provide 24 hours of classic racing. 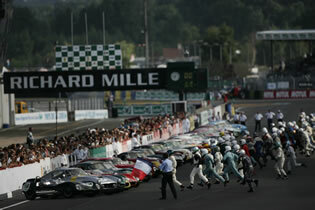 The Le Mans Classic continues to grow in popularity and is an excellent reason to come to Le Mans in July. It is expected to attract over 120,000 visitors to the circuit with 400 racers on the track. The will again be a huge club presence of over 8,000 club cars around the Buggatti Circuit. Public Camping is available on Maison Blanche, Epinettes, Bleu Nord and Beausejour. There is also our ever popular and secure private campsite on Bleu Nord (contact us for more details). Friday is practice day with day and night sessions for each grid starting from 15:00hrs. For the race itself there are 396 cars split over 6 grids, which then race for 24 hours, threerounds in turn.